| Patient, Heal Thyself | Focus on Fat Grafting Fat is one of the hottest topics in plastic surgery today. A 2013 report issued by the American Society for Aesthetic Plastic Surgery found that plastic surgeons performed 72,000 fat transfers in 2012, compared to 38,000 in 1997. Surgeons have long used small amounts of autologous fat in the face to augment soft tissue defects—whether due to genetics, aging or an accident. 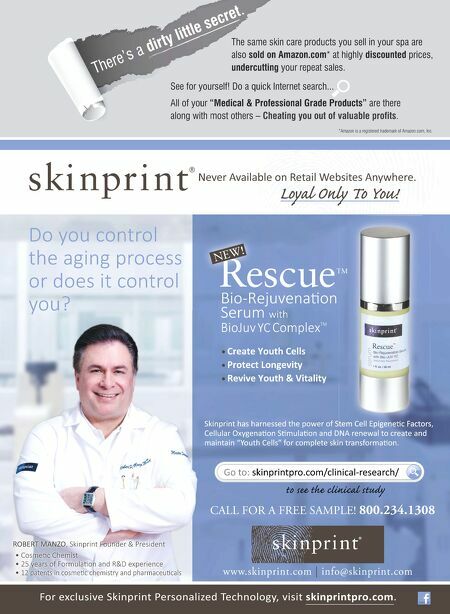 "While the fat can't tighten skin or connective tissue, it can replace lost volume and dramatically improve someone's appearance," says Richard D'Amico, MD, assistant clinical professor of plastic surgery at Mount Sinai School of Medicine in New York City and chair of the American Society of Plastic Surgeons' Task Force on Regenerative Medicine. "Fat grafting also seems to have a nutritive effect on the tissues around it. The overlying skin tends to be improved in texture and contouring [after the fat graft]. Those trophic advantages of fat transfer are pretty unique." In addition to grafting the small amount of fat used in the face, new techniques allow for the use of larger amounts of fat in the body. In plastic surgery, fat transfer can be used in breast augmentation and reconstruction to add volume, and provide a better shape and more natural appearance to a woman's natural breasts. In women who do not have enough natural fat to adequately cover an artiﬁcial implant, injecting fat can enable them to have the implant they want, and still achieve a more natural appearance. Mastectomy patients who have had radiation treatments sometimes experience tightening of the remaining breast tissue and underlying tissues, which can make subsequent breast reconstruction difﬁcult, or even impossible. "Now we're ﬁnding with fat grafting that those radiation changes can not only be improved, but sometimes they will go away," says Dr. Roth. "We've seen softening of the skin, improved color and improved blood supply 20 Surgical Aesthetics ❘ January/February 2014 to the area." The improvements in these cases have been great enough to allow the patient to undergo implant reconstruction that might not have been possible before. Daniel Del Vecchio, MD, a Boston plastic surgeon who has written extensively on the subject of fat grafting, has successfully used autologous fat grafting for breast augmentation in a number of patients, using the BRAVA external expansion device for three weeks prior to surgery to expand the breast tissue to make room for the fat placement. He was able to achieve consistent results, increasing breast volume by 60% to 200%. "Fat transplant is an alternative to an implant, but it's not a substitute," Dr. Del Vecchio says. "An implant is a rigid material. It holds its shape and can generate more projection. Fat is like a mountain of sand, so you can't get a lot of projection unless the base is very wide." 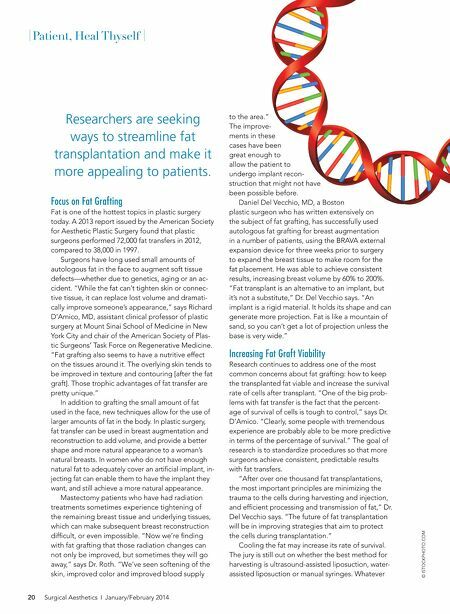 Increasing Fat Graft Viability Research continues to address one of the most common concerns about fat grafting: how to keep the transplanted fat viable and increase the survival rate of cells after transplant. "One of the big problems with fat transfer is the fact that the percentage of survival of cells is tough to control," says Dr. D'Amico. "Clearly, some people with tremendous experience are probably able to be more predictive in terms of the percentage of survival." The goal of research is to standardize procedures so that more surgeons achieve consistent, predictable results with fat transfers. "After over one thousand fat transplantations, the most important principles are minimizing the trauma to the cells during harvesting and injection, and efﬁcient processing and transmission of fat," Dr. Del Vecchio says. "The future of fat transplantation will be in improving strategies that aim to protect the cells during transplantation." Cooling the fat may increase its rate of survival. The jury is still out on whether the best method for harvesting is ultrasound-assisted liposuction, waterassisted liposuction or manual syringes. Whatever © ISTOCKPHOTO.COM Researchers are seeking ways to streamline fat transplantation and make it more appealing to patients.